Ehlers-Danlos Syndrome (EDS) is a group of inherited connective tissue disorders that target one’s joints, blood vessel walls, and skin. The condition exists because of defects in the synthesis of collagen, one of the main components that hold connective tissue together. A decrease in collagen causes extremely elastic skin that bruises easily, damaged blood vessels, and loose joints. Approximately one in every 10,000 to 20,000 people in the United States suffer from either type I or type II, and depending on how aggressive the mutation is, the syndrome can be life-threatening. If you suffer from Ehlers-Danlos Syndrome, you may be unable to work and may need Social Security benefits in order to help pay for your living expenses. We are here to help people pursue the disability benefits they need. 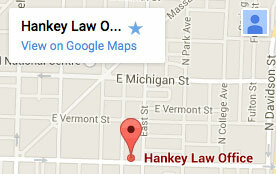 Contact the Indianapolis social security disability attorneys of the Hankey Law Office, at (800) 520-3633 to speak with a legal professional today. In all, there are six major and five minor types of EDS, and family history is the greatest determining factor in whether or not someone will suffer from this condition. If you need Social Security disability benefits, or if you were denied benefits and would like to appeal the decision, contact the Indianapolis social security disability attorneys of the Hankey Law Office at (800) 520-3633.